One of the nicest things about homebrewing is the ability to share the results with others. As a believer in committing random acts of kindness, I am always looking for opportunities to enable people to enjoy a good malted beverage. When my family and I moved into our current neighborhood, we were pleasantly surprised to find out that it has an annual block party. That year it was held just a few months after we arrived, while we were still unpacking boxes. It was a great way to meet our neighbors, and to our delight they were quite friendly and nice. 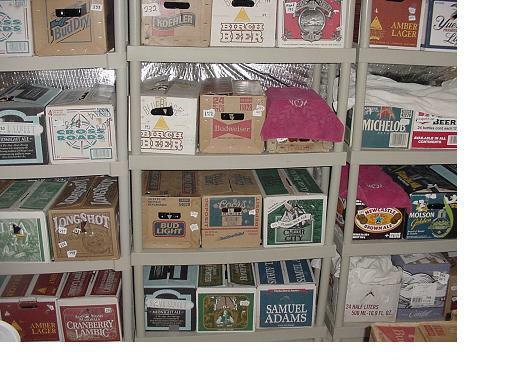 The organizers had supplied a keg of commercial beer as they had done every year. Additionally, I brought some of my homebrew to share. I set up a table with signs describing the different brews and I gave out samples. In a short time people were asking me to fill their cups, and before I knew it I had a line of people waiting for refills. I tried not to let my head swell with all the accolades I was getting. Anyway, the upshot was that the commercial keg remained mostly full, and the organizers requested that I supply the beer at all future block parties. I have gladly accepted this task, not just because I'm a sucker for an ego boost, but because I brew so much that the occasional one-day consumption of 5 or 10 cases doesn't deplete my supplies. To give you an idea of how much I keep in reserve, here's a picture of just part of my stash (this is all homebrew; disregard the brewery names written on the boxes): At the following year's block party one of my neighbors - who had been consuming my pale ales and complimenting me so much that if the two of us had been single I would have wanted to marry her - asked me to supply the beer at her husband's upcoming surprise 50th birthday party. Once again I couldn't resist the opportunity to share my hobby and expose more people to unique beer. I brought about eight different kinds of homebrew, ranging from hefeweizen to stout, and the guests went crazy for it. Some of the guests were from England (where the people take pride in the quality of beer available), and even they raved about the homebrew - so much, in fact, that one of them offered to buy some of it from me, which I could not let him do because of BATF laws. Our community holds a yearly adults-only party at the pool, with lobster and steak for dinner and dancing and water volleyball afterwards. At the first one that my wife and I attended, the hundred or so guests were supplied with two commercial kegs of beer as well as 20 bottles of wine and a case of rum. Though they didn't need any more drinks, I just couldn't show up without homebrew. I brought 80 bottles, thinking that maybe half would get consumed because there were so many other beverages available. It was the best party I had been to in more than 10 years. Our average age was about 40, and yet we danced until well after midnight like a bunch of college kids while the DJ played late-70s/early-80s vintage rock that most of us remembered from our teens and twenties. It's nice to know that being middle-aged doesn't mean that your party years are over! Anyway, as I gathered up my bottles and coolers in the wee hours, I discovered that every single bottle was empty. Curious, I went over to the kegs, and, sure enough, they were about three-quarters full. The following year I brought 103 bottles to this event, and again my neighbors drank every bottle. People showed their appreciation for something homemade, and I was glad to be able to share it with them. Sometimes people show their appreciation with more than consumption and compliments. My friends Jerry and Karin are big fans of the beer I make. When they got married in 1999 they asked me if I'd brew a special beer for them. I was only too happy to fulfill this wish, and I even created a special label to put on the bottles: Well, the wedding and the party afterwards were huge successes (I particularly enjoyed them because they were held outdoors). The guests loved the beer and several of them took bottles (some full, some empty) home as souvenirs. A few months later UPS delivered a fairly large package to my house. I opened it and there to my delight was a 5-gallon oak cask. My friends had sent it as a thank-you for supplying their wedding beer. Here's a picture of it: I had made oak beers before, but only by steeping oak chips in hot water and adding the "oak tea". Now I had an actual cask to age beer in. Before I did that, however, I felt compelled to do an experiment. Whisky gets most of its flavor from being aged in oak, and I wanted to make something whisky-like, so I bought a few bottles of cheap, store-brand vodka and dumped it into the cask. Being brand new, the cask imparted a good amount of flavor in just a few days. I wouldn't say that this vodka/whisky ranks up there with single-malt scotch, but it does taste as good as some of the blends. In fact, some of my friends could not tell the difference between my concoction and a commercial blend in blind taste tests. 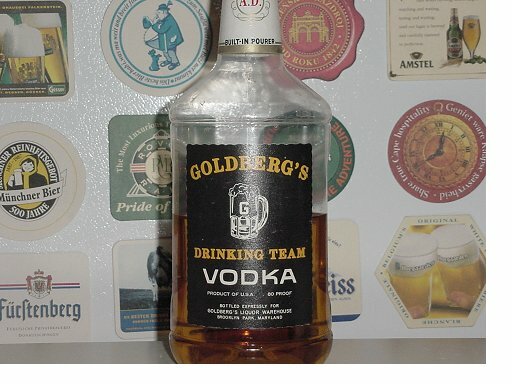 Here's a picture of a vodka bottle containing some of the finished product: I have aged several pale ales in the cask, and every one of them turned out great. My prolific production of oak beers has earned me a reputation among my fellow brewers, and one of my homebrew clubs jokingly presented me with a "Tree Hugger Award". The last beer to come out of the cask was a barleywine that was in there for more than a year and a half, and it came out so complex and wonderful that there is not enough Internet bandwidth to describe it. 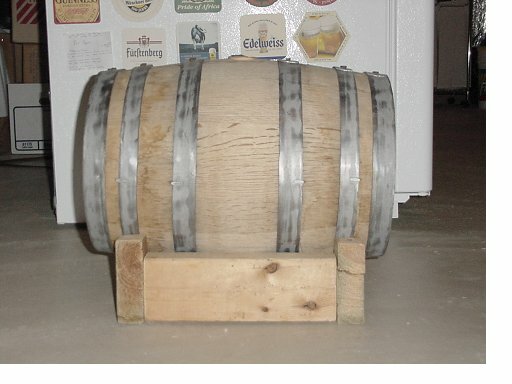 Now that much of the wood flavor has been used up, it is taking longer and longer for beer to acquire it, so I decided to do a long-term project: I bought 5 gallons of the cheapest vodka I could find and filled the cask with it. I plan to tap this keg of "visky" (or is it whodka?) in the year 2022, at which point it will have been aging for 20 years.